Every day. That's how often I use an Apple TV. I have three at home, and one of them always comes with me on vacations. As I type this, my TV is displaying one of those amazing Aerial screen savers (of the Great Wall of China, by the way). I use Apple TV all of the time; that's how I know it needs to get better. 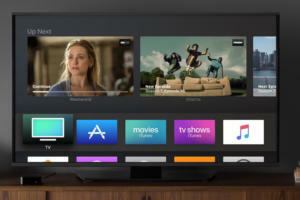 Apple TV is an interesting product in Apple's line-up. For much of its lifespan, it was considered a "hobby." That's Apple CEO Tim's Cook's word. Though Apple execs never marketed the device as strongly as they do iPhones and Macs, personally, I was sold the moment iOS supported AirPlay for Apple TV. Sure, every major platform ecosystem now has the capability to stream images and video to another device hooked up to a TV, but the ability to do so on the Apple TV debuted almost seven years ago. For me, AirPlay has always the best way to easily display movies and photos on an HDTV, and it was the only way to get iTunes content onto a TV. The integration with other Apple products through AirPlay has been an important feature check for those in the Apple ecosystem. Whenever I considered the alternatives, -- everything from Google Chromecast to Roku and the Amazon Fire Stick -- the fact that I stored my content in iTunes and the convenience of AirPlay gave Apple TV the edge. As of now, the Apple TV hardware hasn't been updated in 520-plus days and counting. The current model arrived in October 2015. Usually, I'm not concerned about the length of time between updates. Apple has a solid history of supporting its hardware lines with consistent software updates. Case in point: An update for Apple TV arrived on Monday, eliminating the "scrolling through long lists" issue I would have complained about. So it's not as if Apple has abandoned its hobby, like so many Android devices that won't see any updates long before their usefulness is over. Despite a dearth of hardware updates, new features, security updates, and bug fixes continue to trickle in for Apple TV. But there are some things software can't fix, and Apple under Cook seems to have but one priority when it comes to regular hardware updates -- the lucrative iPhone line. Given the revenue the iPhone brings in, this makes sense. But when you consider other products like the Mac Pro -- which hasn't been updated now in three years -- and the Mac mini, the question becomes: What's going on here? To be blunt, I'm concerned that Apple TV is a core product that is being ignored in an era of increased competition from smaller and cheaper alternatives. The iPhone -- the "corest" of Apple products -- is safe from being outgunned by competition because every resource at Apple is dedicated to it. The Mac notebook and iMac lines are beholden to Intel's processor launch schedules, but remain more or less competitive with similarly-specced PCs. But the Mac Pro and Mac mini continue to languish. I don't want the same thing to happen to the Apple TV. It's easy to second-guess Apple's strategy, especially since the public isn't privy to the data corporate decisions are based on. Yet that doesn't change the fact that the Apple TV -- for all of the software updates it's received -- needs major hardware updates if Apple wants to keep the device competitive. The Apple TV needs 4K support, as soon as possible. I understand why a 4K model hasn't been rushed to market -- mainly because 1080p high-definition is the sweet spot for most TVs. Meeting the demands of most users is a financially sound decision. It's a safe decision. Certainly, the processors capable of decoding 4K video would have eaten into profit margins, or forced higher Apple TV prices. But remember when Apple used to be the forward-thinking company? Okay, maybe that's a tad inflammatory. In many cases, Apple products are (or at one point were) market leaders in forward-thinking. Think about the original iPod, iTunes, the first iPhone and iPads. Or the latest MacBook Pros, and the shift to USB-C ports. Going all in on USB-C was a very 'Bondi Blue iMac' decision by Apple. But I'm concerned about the Apple TV. 4K isn't an inevitable future possibility, it's happening now, in more and more households as potential cord cutters look for viable solutions. Embracing 4K lets current 4K TV owners in the Apple ecosystem use their TVs as God intended, and it gives developers a higher resolution canvas to design for. And in case you haven't noticed, 4K TV sales are soaring as prices plummet. Thankfully, the arrival of 4K on the Apple TV seems to be coming soon. But that's not the only thing needed. This may be a stretch, but why not ship the Apple TV with game controllers? It doesn't have to be complicated; even something as simple as ancient SNES controllers would work. If Apple were to leverage its position and ship game controllers with the next Apple TV, it would give developers consistent hardware standards to write games around. Right now there are third-party options for controllers -- as well as the capability to use an iPhone as a game controller -- but that's not enough. If Apple wants its Apple TV to be a Trojan horse into the living room, the company needs to give buyers (and developers) something to cheer about. An Apple TV that's also a gaming machine could be a major differentiation from competing devices, and it would allow Apple to attract users who might not want to pay PS4 and Xbox money for gaming. Gaming could and should be treated as part of the next Apple TV's core functionality. There's been much talk over the years about Apple's desire to revolutionize the living room TV with Apple TV, but that hasn't yet happened. An Apple TV revamp doesn't need to reinvent the wheel to gain a bigger foothold; it just has to do what it does now, at higher resolutions and -- if Apple needs to justify a higher starting price -- offer real gaming support. So what's it going to be Apple -- stick with the hobby or get serious?